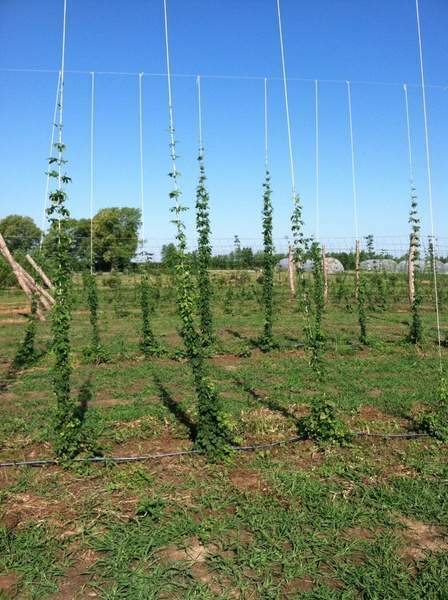 Purdue University Hops, an ingredient in beer, grow on a trellis 18 to 20 feet tall. Some home brewers grow their own hops. Sugar Creek Farms The commercial hops industry in Indiana is still in its infancy, growing from eight acres in 2014 to 25 this year. When a group of people start talking about growing their own buzz, it might be smart to back away. But in the case of Indiana’s craft-beer and home-brew enthusiasts, growing a key ingredient of their favorite buzz is perfectly legal. 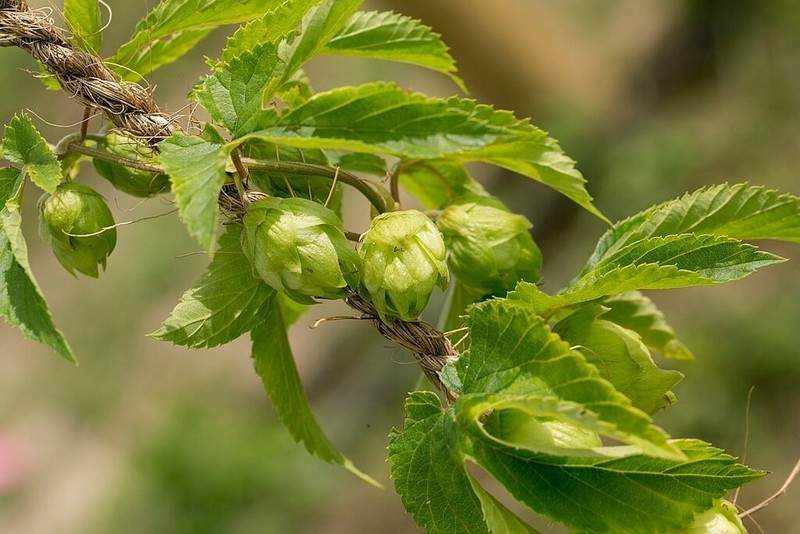 The ingredient is hops, a plant whose green female flowers, also called cones, help give beer its sharp, characteristic hoppy" taste, while balancing the sweetness of other ingredients such as malt. Most hops used in beers throughout the world are grown in Germany, England and the Pacific Northwest. But now more Indiana growers, both hobbyists and professionals, are jumping in. Interest in growing Hoosier hops has grown so much recently that Purdue University sponsored a growers’ conference and put out a report this year about best practices in managing hops’ weeds, diseases and pests. The university also is in its second year of working with a half-acre experimental plot growing six varieties of hops at its Meigs Farm south of Lafayette, says Natasha Cerruti, research assistant. Cerruti says one reason for the research is that many current varieties of hops have been adapted to grow in the Northwest, where the climate is different from Indiana’s. "We have a lot more rain in the summer. We’re wetter and more humid," she says – no surprise there to anyone who’s weathered this June’s muggy first two weeks. Another reason for the research is that growing hops isn’t exactly easy. While hops do grow wild in Indiana, Cerruti says, cultivation is "labor intensive and there are lots of unknowns." Hops grow from root pieces called rhizomes or, sometimes, plant cuttings. They produce long, twining shoots that have to be pruned early in the season to select the most vigorous ones. Then the plants need to be trained to climb. 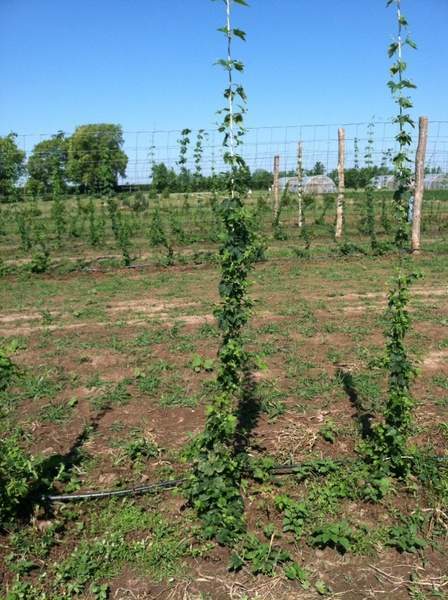 When Cerruti explains that one test being done at the farm is whether hops grow better on a "dwarf" netted trellis about 10 feet high, one gets the picture that hops are not exactly dainty in size. "Most people put them on an 18- to 20-foot-high trellis with strings that they grow up on," she says. Young hops plants also aren’t exactly prolific when it comes to producing their coveted cones, and plants are susceptible to pests and diseases, especially downy mildew, Cerruti says. This growing season’s warmth and wetness have made downy mildew problematic early on, she explains. Specific fungicides and cultivation practices, such as allowing plenty of space around individual plants for air circulation and scrupulous cleaning of implements are recommended for controlling it, according to Purdue experts. Another consideration is limited daylight, growers say. The Northwest has more hours of sunlight in the summertime, and that boosts growth and yields in that area. Although it’s too soon to draw too many conclusions from the research, Cerruti says, she notes that the Cascade variety of hops grown in the Northwest has performed well on the farm. Other information from the Purdue tests, she adds, should aid the burgeoning, if still infant-sized, Indiana hops industry. Growing hops commercially in Indiana has more than tripled between 2014 and 2015, from eight to 25 acres, reports the Hop Growers of America in Moxee, Washington. Even more hops, hardy down to the USDA’s plant zone 4, are being grown in Michigan, which produced 300 acres of hops last year. About 39,000 acres of hops are harvested nationwide, according to the growers association. In Indiana, the largest grower of hops is Sugar Creek Hops in Thorntown, which planted five acres of the crop beginning in 2014. The family-owned business also brokers hops from other growers and ships hops domestically and internationally, president Spencer Gray says. The company also has a small breeding program using wild hops found in Indiana and will open a state-of-the art processing plant in August, he says. Although unprocessed hops can be used in beer, craft brewers and many hobbyists use hops dried and processed into pellets. Gray says producing hops commercially is "an entirely new endeavor in Indiana" and is being fueled by the more than 50 craft breweries now operating in the state and the distinction attached to brewing using local ingredients. But with so little known about cultivation, the time needed to breed more adapted varieties, the large quantities of hops needed to brew commercially and the fact that brewers contract for hops years in advance, growing hops has a long way to go in Indiana, he says. "Indiana can have a hops industry if we want it to. It will be a slow, hard and expensive process," he says. "But it has the potential to yield great benefits to not only growers, but brewers, beer drinkers, our environment and our economy."